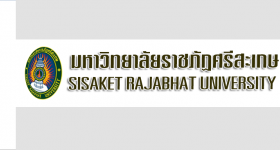 Sisaket Rajabhat University is one of the higher education institutes recognized by the government and situated in the province of Sisaket, the part of northeastern Thailand. The university was first established as ‘Sisaket Rajabhat Institute’ in 2001. It was changed into the university in 2004. The university’s philosophy is: to be knowledgeable and virtuous, to lead a sustainable community, to be a source of Thai wisdom. Its missions are to organize an education, provide an educational service, conduct research and maintain arts and culture. In addition, it was evaluated and passed a performance standard set by Office of the Public Sector development Commission, especially in 2008. It was ranked 12th , in 2009. It was ranked 11th and it was ranked 4th out of 40 Rajabhat University.